Michael was, literally, a walking encyclopedia of knowledge about Colombia’s war-torn history. That’s an overused term, “war torn,” but it fits. We whizzed through a museum complex that featured fine art, massive coin-minting equipment, and gold objects. The complex itself was beautifully designed—simple, clean lines to show off the art and artifacts—and featured serene courtyards with gardens and fountains. I would have loved to stop and just sit, or walk slowly through to see what all was on display. But Michael had an itinerary he was holding to, and he seemed disdainful of the museums because they held items from the days of The Conquest and were sponsored by big banks. I could have that last part wrong. He was throwing so much information at us. He showed us a collection of Catholic worship items; I believe one would be a called a Monstrance. 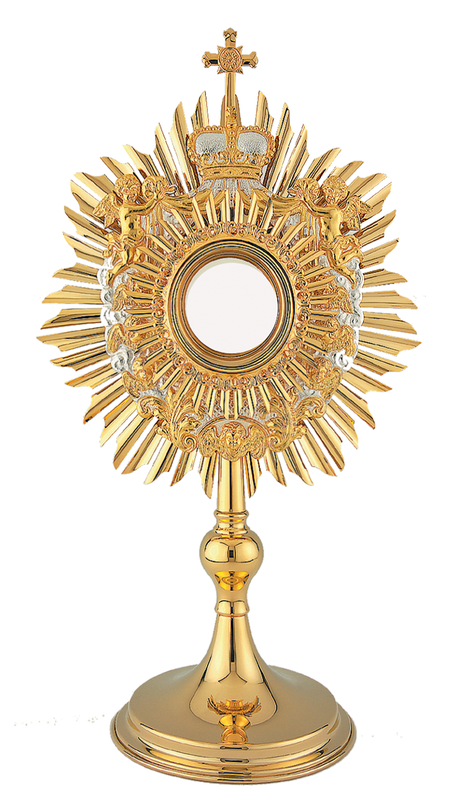 This is a picture of a Monstrance from an online search. The one in the museum made the one above look bland. We weren’t allowed to take photos, but it was encrusted with emeralds and pearls and adorned with gold filigree and gold figures from biblical scenes. I don’t know what Monstrances are for, and I don’t care. Lynn and I had seen one in Spain that was even more … monstrous. We were well aware that the gold, pearls, and emeralds had been plundered local, probably by enslaved indigenous people. We were receiving a great education from Michael, but for three hours he had been marched us through the city in the heat and sun. The hotel staff had said the water was okay to drink but when I went to fill my water bottle it smelled so strongly of chlorine I decided to leave it behind. And the altitude was winding us. I had gone from 700 to 8,660 feet above sea level. Just in time, Michael brought us to a covered market full of stalls selling fresh fish and seafood, beans and peas and spices and veg and fruits. 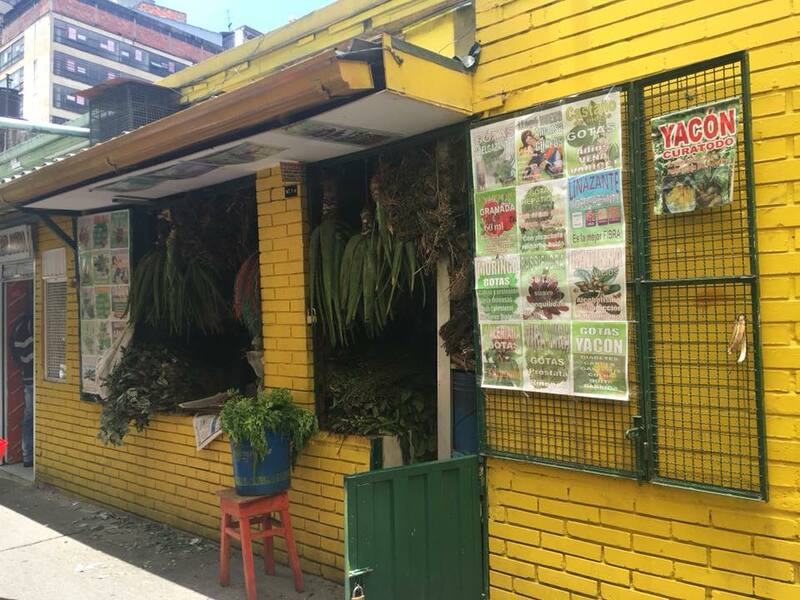 This little store outside the entrance to the market sold medicinal herbs. I think Lynn and I both exclaimed, “Ahhhh….” as we entered, both because it was a respite from the heat and a feast for the eyes. 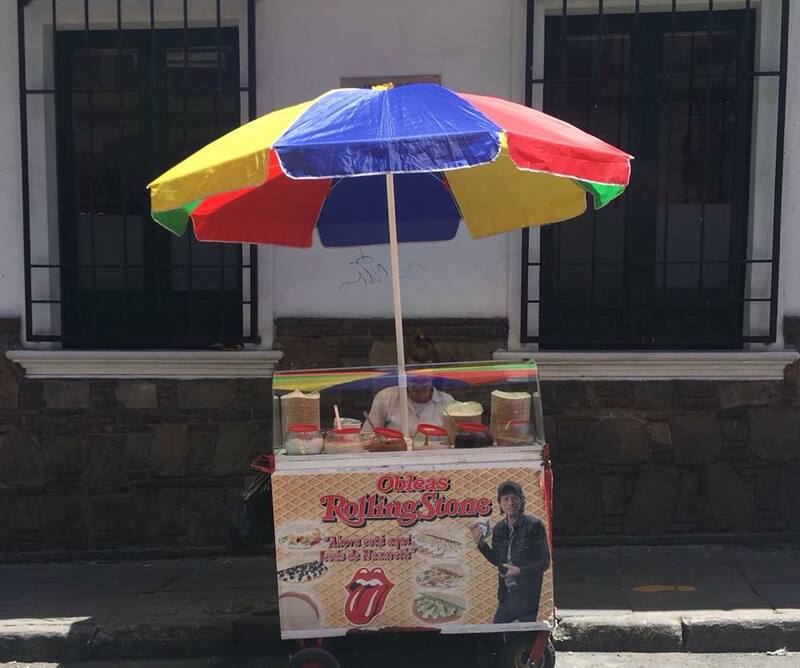 We stopped at the stall of a fruit vendor Michael knew. “You can sample seven fruits for 6,000 pesos,” he informed us questioningly. Did he think we were going to say no? Six thousand pesos is $2.00. I cannot tell you what the seven fruits were, only that they were delicious and revived us instantly. 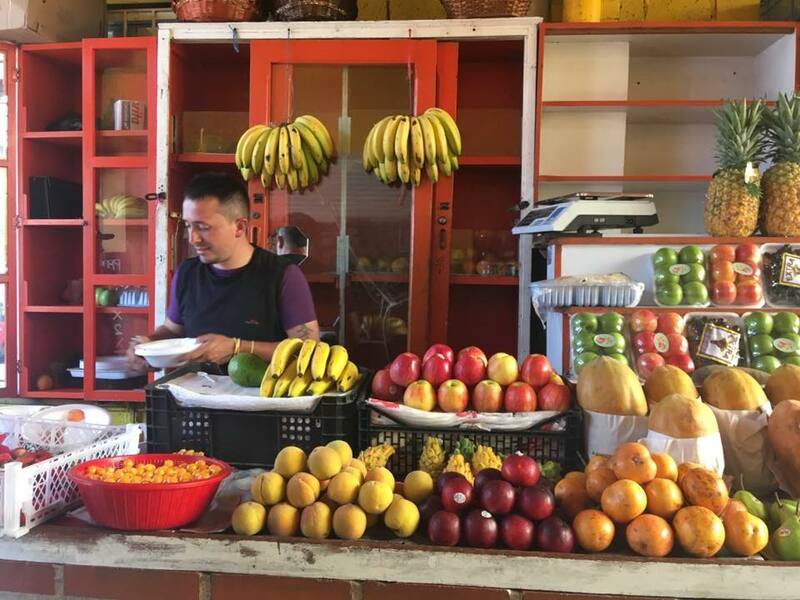 “I keep thinking of that advice you read over and over in guide books,” I murmured to Lynn as we watched the vendor peeling and slicing the fruits. “But they’re so good!” answered, as sticky juice ran down my hands. “Jorge has triplets,” Michael said by way of introduction of his friend. “Oh, how old are they?” I asked in Spanish. “The oldest one is 16,” he replied. Hmmm. Maybe Michael had meant “three children” by “triplets.” I was too busy shoveling in fruit to ask a follow up question and besides, Michael and Jorge were clearly having a bit of catch up on the local gossip or something that didn’t need to include us tourists. Then we were off again, and now we were walking slightly streets that led slightly uphill which normally I would have found invigorating. But Lynn and I had to stop every now and then to catch our breath. Michael took advantage of one pause to point out a vendor who had purportedly renamed her stall in honor a famous visitor. This entry was posted in Adventure, Budget travel, class divide, Culture shock, Travel and tagged Bogota, Colombia, Conquest of Columbia on April 8, 2018 by Breaking Free.